This comfortable, reusable silicone cup is worn internally and collects, rather than absorbs, your period. Every woman who cares about sustainability has probably noticed that tampons are not great for the planet. 20 billion menstrual products are disposed of annually in the USA. Here's a much better idea: a reusable cup worn internally like a tampon, but that collects—rather than absorbs—your period. Easier to use, more comfortable, and more secure than older cups on the market, when you're wearing it, you can swim, bike, and do yoga without fear. Remove, empty, rinse, and reinsert every 12 hours. Save money, create less landfill fodder, and join the Tampon Liberation Front, a group we invented just now. Made in California. When changing: Remove the cup (always use clean hands) and rinse first using cold water, then wash using warm water and mild soap. Rinse again to completely remove any soap. Your Saalt Cup is then ready to reinsert. 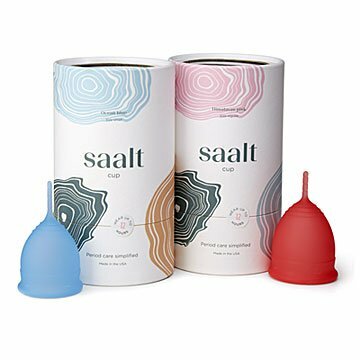 I have been dancing my whole life and have searched forever to find a period care product that let me move without worrying...I finally found it in Saalt. If you're a dancer or active in any way I would totally recommend a Saalt cup. I went with the small and it worked great. The Saalt period cup is a life changer! It was easy to insert and very comfortable. So much safer, healthier, less expensive, and better for the planet than tampons. I have to admit I was expecting a BIG learning curve with switching to a menstrual cup. I have been wanting to try one for a while and really loved Saalts message and support as well as all the good they are doing for women around the world. It was easy to learn how to use it properly and actually after reading about the different folds I figured out how to use it correctly pretty quickly. The larger size is great because I have a heavier flow. On my heaviest day I do have to check it in the middle of the day but otherwise I can go 12 hours and over night no problem! Saalt has a lot of support for answering your questions and they truly care about you having a good experience and learning to use their product. There were no leaks at all! Even over night and during my really heavy days. I normally have to wear a pad with an Ultra tampon on my heavy days and I didn't need any backup for the cup! I even have a tilted uterus and these cups worked great. Totally comfortable all day and over night. Not any messier then dealing with tampons. In fact I felt cleaner and more comfortable then I ever have during my cycle. I would (and have) recommended these to all the women I know! Seriously the best and I only wish I tried them sooner!